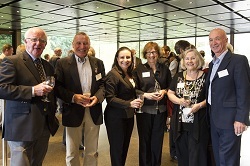 On Wednesday 12 March over 50 benefactors of La Trobe University celebrated our first Chancellor’s Circle event in the Persimmon Room at NGV International. The Chancellor’s Circle is a new community of donors who have given $1200 or more per annum to La Trobe students and/or research. There are currently around 120 members in this special group which is comprised of alumni, staff and friends of La Trobe who share our vision for a stronger future. The event provided an opportunity to welcome our donors to the Chancellor’s Circle. It also enabled us to collectively celebrate the great work being done at La Trobe and importantly to thank these generous individuals and organisations for their vital support. Following the formal proceedings of the event, guests were invited to a private viewing of the Melbourne Now exhibition, of which La Trobe University is the educational partner. To find out more about The Chancellor’s Circle and fundraising at La Trobe please contact Jo Watts at j.watts@latrobe.edu.au or call (03) 9479 5015.